The SEC’s seen a quick trigger finger before. Marshall Henderson attempted 23 threes in 36 minutes in Mississippi’s 115-105 overtime loss to Oregon yesterday. Henderson fared quite well against the Ducks, sinking 10 of those attempts and scoring 39 points, but it was not quite enough for the Rebels to win at home against a top-15 opponent. Head coach Andy Kennedy has been bringing Henderson off the bench thus far this season, as the Ole Miss star works his way out of the doghouse after an offseason filled with the wrong kind of headlines. But whether or not he’s on the floor for the opening tip, Henderson’s averaging 25 minutes a game on a team where the top five players all log between 24 and 28 minutes per contest. Meaning Henderson is a reserve in name only, and, anyway, he’s taking fully 40 percent of the Rebel shots that occur during his minutes. People love to ascribe various motivations to Henderson, but keep in mind whenever a player’s taking this many shots there’s a head coach behind him saying, in effect, yes, this is a good idea. Henderson has a green light, but it’s Kennedy who controls that switch. If we could run 10,000 simulations where every player in Division I were given as many shots as Henderson is permitted, the likelihood is that the Ole Miss star would rate out very well in terms of effectiveness — very well but not phenomenally so, and certainly not, of course, No. 1 overall. Yet somehow Henderson is the only major-conference guy who got an affirmative reply in response to: “Hey, Coach, let me take 40 percent of the team’s shots.” How did this happen? When the anthropologists parachute in to study our game’s peculiar folkways, this question will be very high on their research agenda. Virtually by definition, no aspect of Henderson’s performance can be as extreme as the number of shots his coach permits him to attempt. He’s not going to compete with the far lower-volume likes of Michael Frazier and Nik Stauskas for the label of most accurate major-conference three-point shooter, naturally, nor will he be in the running with someone like Doug McDermott or Russ Smith for the title of most efficient high-volume scorer. Certainly when you let someone shoot 23 threes, your team’s fortunes will rise or fall to an unusual degree according to what happens with all those attempts. But that’s merely a Henderson-free structural description of the license that’s been given to just one player. What’s notable in that equation is the coach’s decision. Notable but not necessarily unprecedented, or even that extreme. At least one featured scorer from yesteryear actually shot more often than Henderson and his contemporaries do. Way more. 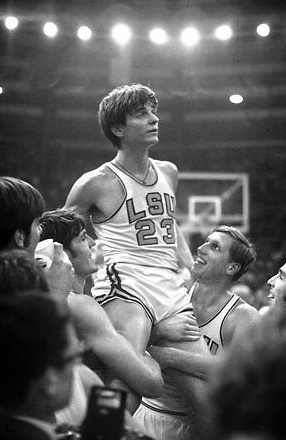 In 1969-70, Pete Maravich personally accounted for 46.0 percent of LSU’s shot attempts. Note I didn’t say “during his minutes,” or “while he was on the floor.” I’m referring instead to the respective season totals (Maravich: 1,106) for FGAs (LSU: 2,403). If anyone has a number for how many minutes Maravich played in 1969-70, let me know and we’ll come up with a shot percentage for Pistol Pete. For example, if Maravich averaged less than 37 minutes a game his shot percentage was over 50. That, my friends, is a green light. Suffice it to say if Marshall Henderson wants to be the most assertive shooter the SEC has ever seen (or even the most assertive shooter in the nation right now), he needs to convince Kennedy to give him some more freedom. Enough with the timid half-measures, already. Let Marshall be Marshall. This entry was posted in counting things, florid historical references, hoops on December 9, 2013 by johngasaway.